Create a sense of protection or remember a loved one with an angel locket necklace. 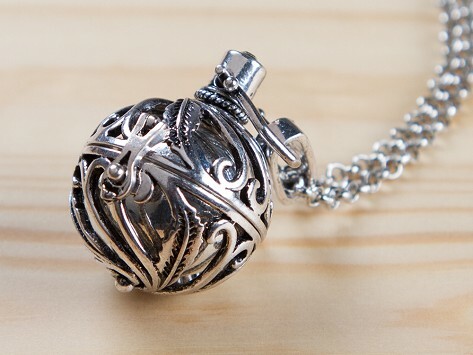 Instead of a picture inside, this filigree-like locket holds a chime ball. It makes a subtle, light chime that serves as a gentle reminder of the spirit of someone special. 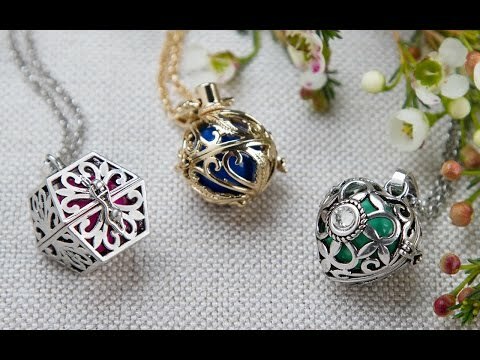 Customize the locket by choosing the color of the ball—pick one with a special meaning or just your favorite color. Pretty, and unique. My niece loves it! I am enjoying this angel locket. It's beautiful and I wear it a lot! Teen entrepreneur Shelby Golguski and her brother Gordon created Yourself Expression to share things they love with others—young and old. Their Angel Lockets merge customized accessories and an on-trend look perfectly. Each is a great way to express love and remembrance, at any age. They feature filigree-like detailing with crystal accents. And, instead of holding a picture inside like a traditional locket, each one houses a sphere with a chime inside. You personalize each necklace by choosing the color of the sphere—it could be something symbolic to you or simply your favorite hue. The chime makes a subtle, light sound, serving as a gentle reminder that someone is thinking of you and always with you in spirit. Each locket is meant to keep love and protection around you—or the person you give one to.